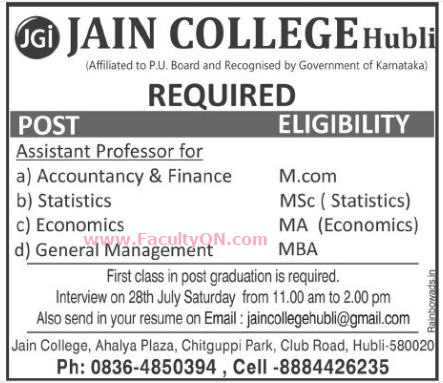 Jain College, Hubli has advertised in DECCAN HERALD newspaper for recruitment of Teaching Faculty- Assistant Professor jobs vacancies. Interested and eligible job aspirants are requested to walk-in on 28th July 2018. Check out further more details below. About College : Jain College Hubli, is an institute of the prestigious JGI Group headquartered at Bangalore. The group represents a cluster of 85 educational establishments that are home to over 45000 students from across the world & over 4500 staff members engaged at the P-12, undergraduate & postgraduate levels across 64 campuses and centres of excellence. Note: First class in PG is required for all departments mentioned above. How to Apply: Interested and eligible candidates are requested to send CV along with all copies of certificates / testimonials and recent PP size photos to the email address provided here and then attend the WALK-IN on 28th July 2018.